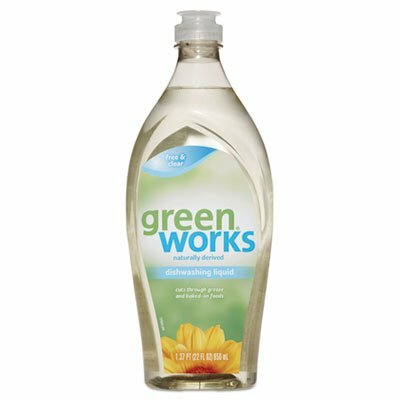 Green Works® Dishwashing Liquid combines powerful cleaning performance with naturally derived and plant based ingredients to fight tough greasy messes and yet be gentle on your hands. The powerful cleaning formula cuts through tough greasy baked on food, leaving nothing but a natural, streak-free shine. Greasy messes and splatters easily rinse away without any harsh chemical residue on your dishes. Dermatologist tested, this dishwashing soap is gentle on your hands while washing even the dirtiest pots and dishes. With Green Works® naturally derived cleaning products, you get powerful cleaning done naturally. Application: Manual Dishwashing Detergent; Applicable Material: Ceramic; Corian®; Fiberglass; Glass; Metal; Plastic; Stone; Wood; Dirt Types: Baked-On Grease; Food Debris; Oil; Organic Matter; Soil; Scent: Free & Clear. If you have any questions about this product by Greenworks, contact us by completing and submitting the form below. If you are looking for a specif part number, please include it with your message. FINISH 89729CT Powerball Dishwasher Tabs, Fresh Scent, Box of 85 (Case of 4 Boxes). Genuine Joe 99675 Pot and Pan Detergent, 38 fl. oz.